At PrankTexts.com, we keep our prices super low. And the more credits you buy, the cheaper each credit is in price - meaning you can play even more pranks on your friends. We are the ONLY prank texts service that gives away a FREE prank text - so you can try before you buy! The more credits you buy, the cheaper they are! 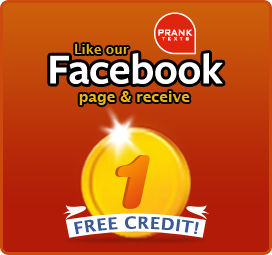 It’s simple to add credit to your PrankText.com account. All payments are processed through our secure PayPal account. Remember, you do not need to have a PayPal account - you can simply pay via your Debit or Credit Card.